Time is running out for those opposed to the proposed changes to the Kentucky Sandhill Crane season. Unfortunately, due to lack of public comment in March 2018 when the Kentucky Department of Fish and Wildlife Resources District Commissioners met, some of the Commissioners thought there was no opposition to the changes in the season regulation, and subsequently voted to send it on to the Legislative Research Committee for approval. After seven years of the “new” Kentucky Sandhill season that saw consistently low hunter participation and seasonal “harvests” of less than 200 cranes, regulation increases are now in the works. The amended hunt regulations promise extension of the season from 30 days to 56 days, and the harvest limit of 400 cranes will become the maximum allowed by USFWS – almost three times that number of cranes. While a zone-closure of the eastern portion of Green River Lake to allow an additional roosting area for the cranes is commendable, the reasoning behind it is solely for hunter opportunity. Cranes will continue to be vulnerable to hunting as they come and go from this “protected” roosting area, making the new “wildlife viewing opportunity” promised by this closure non-existent. The following gives details for making your comments, and/or attending the scheduled public hearing. Act now! 301 KAR 2:228. Sandhill crane hunting requirements. (a) What this administrative regulation does: This administrative regulation establishes sandhill crane seasons, bag limits and requirements on public lands within federal migratory bird hunting frameworks established in 50 C.F.R. Parts 20 and 21 according to the U.S. Fish and Wildlife Service (USFWS). (b) The necessity of this administrative regulation: The necessity of this administrative regulation is to establish the 2018-2019 sandhill crane hunting requirements on private and public lands in accordance with the USFWS and Department management objectives. (c) How this administrative regulation conforms to the content of the authorizing statutes: KRS 150.025(1) authorizes the department to promulgate administrative regulations to establish open seasons for the taking of wildlife and to regulate bag limits. KRS 150.360 authorizes the department to restrict methods for the taking of wildlife. KRS 150.600 authorizes the department to regulate the taking of waterfowl on public and private land. This administrative regulation establishes procedures for the taking of migratory game birds within reasonable limits and within the frameworks established by 50 C.F.R. Parts 20 and 21. (d) How this administrative regulation currently assists or will assist in the effective administration of the statutes: By establishing sandhill crane hunting seasons and area specific requirements, this administrative regulation maintains and manages migratory game bird conservation efforts consistent with national and international management goals. (a) How the amendment will change this existing administrative regulation: This amendment will change the timing of the season and season length to coincide with duck seasons. It will change the number of permits available from a fixed 400 permits to the maximum allowed by the USFWS for that season. Tags with each permit will go from a fixed two (2) per permit to a system where one (1) tag is allocated to each permit holder and any remaining tags are allocated to permit holders in order of drawing. The application period for sandhill crane permits will be moved to September with the drawing held in early October. The eastern portion of Green River Lake will now have a no crane-hunting zone created. This amendment also removes a season closure if harvest were to reach 400 cranes. (b) The necessity of the amendment to this administrative regulation: This amendment is necessary to provide additional hunting opportunity for Kentucky’s sandhill crane hunters, to move the application period to September to conform to other quota hunt application periods, and to protect a roosting area on Green River Lake. At the completion of Kentucky’s Experimental Season Period, the USFWS granted Kentucky additional harvest opportunity. This amendment allows for additional hunting days (56 vs. 30) while simplifying regulations similar to duck seasons. For the 2017-2018 season, 30% of applicants were turned away for a lack of permits. The new application period also provides additional time for the delivery of permits and tags. The closure of crane hunting on Green River Lake protects a roosting area that will result in additional hunting and wildlife viewing opportunity. (c) How the amendment conforms to the content of the authorizing statutes: See 1(c) above. (d) How the amendment will assist in the effective administration of the statutes: See 1(d) above. (3) List the type and number of individuals, businesses, organizations, or state and local governments affected by this administrative regulation: For the 2017-2018 season, there were a total of 565 applicants for the crane quota hunt. (a) List the actions that each of the regulated entities identified in question (3) will have to take to comply with this administrative regulation or amendment: Applicants will now be required to apply during the month of September, and hunters will be prohibited to hunt in a protected area of Green River Lake. (b) In complying with this administrative regulation or amendment, how much will it cost each of the entities identified in question (3): There will be no additional costs in order to comply with this amendment. (c) As a result of compliance, what benefits will accrue to the entities identified in question (3): More hunters will be able to participate in the annual crane hunt, and it is possible for hunters to harvest an additional crane depending on the number of applicants and their draw ranking. The prohibited hunting area in Green River Lake will protect the crane population in a key roosting area, which is important to the long-term sustainability of the population. (b) On a continuing basis: There will be no additional cost on a continuing basis. (6) What is the source of the funding to be used for the implementation and enforcement of this administrative regulation: The source of funding is the State Game and Fish Fund. (7) Provide an assessment of whether an increase in fees or funding will be necessary to implement this administrative regulation, if new, or by the change if it is an amendment: It will not be necessary to increase any other fees or increase funding to implement this administrative regulation. (8) State whether or not this administrative regulation established any fees or directly or indirectly increased any fees: No new fees will be established directly or indirectly. The Kentucky Department of Fish and Wildlife Resources (KDFWR) is now considering a proposal to expand the Sandhill Crane hunting season. The KDFWR Wildlife Committee has forwarded the suggested changes to the full Commission which will consider them during its meeting March 23, 2018. If you would like to share your opinion on the proposed changes to the Kentucky Sandhill season, now is the time to do so. Call or write your Commissioner prior to the meeting (see listing below for your area district Commissioner information). While speaking directly to your district Commissioner might be more impactful than letters, feel free to call and write. Please be courteous. After 7 years of following guidelines set in the Kentucky Department of Fish and Wildlife Resources (KDFWR) experimental season, the wildlife division plans to recommend to the full Commission six changes to the season. These proposed changes were considered by the Wildlife Committee on February 9 and will be presented to the full Commission for a vote on March 23, 2018. “While these changes represent some liberalization, they still follow the guidelines set in a very conservative EP crane management plan. As before, we expect no impact of these changes on the population or on viewing opportunity in Kentucky,” said John H Brunjes, Migratory Bird Program Coordinator for KDFWR . 1) Move the application period to September. Current application period is November 15-30. This creates a real challenge for us to get drawing done and get everyone tags mailed before hunting starts two weeks later. It forces us to mail tags before people have completed online test and have actual permit. We would like to have application period September 1-30 with a drawing in early October. People would then have to complete the online test before tags are mailed to them. 2) Create a no crane hunting zone in Green River Lake. Last winter and again this winter, several hundred SACR showed up and roosted on Green River Lake. They were there for about a week before they left. We suspect they were shot on the lake and abandoned the roost. In a method similar to the Barren River Protected area, we would create a refuge area for cranes by closing crane hunting portions of Green River Lake. Having another roost area would provide additional viewing and hunting opportunity. We suspect this will become a regular revision to this regulation as the population continues to grow. There were brief stops by cranes at Lake Cumberland and Taylorsville Lake and if those continue we would protect those areas as well. 3) Remove the 400 crane closure. The 400 bird closure was a conservative measure added to our experimental season plan as a fail-safe in case our predictions about harvest and how hunting would go were wrong. After 7 seasons without exceeding a 200 crane harvest; having to check each day to see if the season is closed is unnecessary burden on our hunters. Additionally, because we have gone so long without reaching the 400 bird mark, we fear hunters are not checking to see if the season is closed. If we ever did reach 400 birds and close the season, we fear hunters could continue hunting and be cited. The Eastern population of sandhill cranes is now well over 100k birds. The removal of the 400-bird closure would not have any meaningful impact on the population. 4) Change number of tags available to Kentucky hunters. The EP Sandhill Crane plan endorsed by the Mississippi and Atlantic flyways and USFWS allows states to issue tags based on a 5-year average of crane numbers in that state. A state may issue up to 10% of that 5-year average. Currently Kentucky is issuing 800 tags of the allowable 1,453 tags based on our 5-year average of 14,526 cranes. We propose changing from a fixed 800 to issuing the 1,453 allowed by the management plan. Currently we issue a fixed number of permits (400). Before last season, we had not had more than 400 applicants so it had not really been a concern. For the 2016-2017 season, there were 415 applicants so 15 people did not get a permit. For the 2017-2018 season, there were 565 applicants so 30% of those that applied will not get a permit. We propose a new system where everyone that applies gets randomly selected in a drawn order. Each person gets a permit with one tag up to the allowable number of tags to be issued for that season. That way everyone would at least 1 tag. Any tags that were not used in the initial allocation of 1 tags per hunter would be allocated out to drawn hunters in order of draw. Using this season as an example, all 565 applicants would be issued permits and all would receive a second tag for a total of 1130 of the 1453 allowable tags. The first 323 people drawn would receive a third tag so that we issue all 1453 tags. Under the Eastern Population Crane management plan, Kentucky may have a 60 day season between September 1 and January 31. Split seasons are not allowed. We propose making the SACR season concurrent with the second waterfowl season (a 56-day season) in Kentucky. This simplifies regulations for migratory bird hunters and provides additional opportunity for our hunters. The biggest hurdle faced by hunters is the access to private land. A longer season increases the likelihood someone could gain access to hunting areas. According to USFWS, the eastern population of Sandhills continues to expand. When KDFWR began consideration of a hunting season, the 3-year average was 46,000 cranes counted in the fall survey. Today, that average count exceeds 90,000 cranes. Because it is a one day count, and not an estimate, the department biologists say it represents a conservative minimum population size. Telemetry data tells biologists that at least 20% of the population is being missed in the surveys. Reproduction surveys consistently show that >10% of the cranes passing thru Kentucky are young of the year. These results are mirrored by work of the USFWS at Jasper-Pulaski. According to USFWS, a dramatic expansion of breeding ranges has been seen and now in many areas Eastern Population Sandhill cranes nest side by side with mid-continent cranes. Yesterday the Center for Biological Diversity added $5,000 to the reward for information leading to a conviction or fine in the latest illegal killing of #4-11, an endangered Whooping Crane in Indiana. “We’re adding to this reward because Whooping Cranes are a critical part of America’s heritage, and we shouldn’t let a few killers deny future generations their opportunity to see these animals in the wild,” Adkins said. Since then, others have also stepped forward to donate, bringing the reward to $15,600. Read the Center for Biological Diversity press release here. Female Whooping Crane #14-11. Photographed in early 2016 by Bob Herndon. Indiana Conservation Officers have partnered with Indiana Turn in a Poacher (T.I.P. ), Friends of Goose Pond, the International Crane Foundation and Operation Migration to offer a substantial reward of $10,000 for information leading to the arrest and conviction of the person(s) responsible for killing female Whooping Crane #4-11 in Greene County, Indiana in early January. On January 3, 2017 an International Crane Foundation volunteer found the crane near Goose Pond Fish and Wildlife Area. It is thought she was killed with a high powered rifle but her remains were sent to the National Fish and Wildlife Forensics Laboratory in Ashland, Oregon for further testing. “Reintroducing an endangered species takes money, hard work, luck and expertise. I was privileged to fly alongside #4-11 and to help teach her to migrate. She survived on her own and made five trips south in the fall and back north in the spring. She found a mate and even produced a chick. Then to have someone waste all that time, effort and such a beautiful bird for nothing more that the pleasure of the kill is a selfish, wasteful tragedy,” said Operation Migration’s Joe Duff. Indiana Department of Natural Resources officials reported that the remains of No. 4-11, a 5-year old female Whooping Crane of the Eastern Migratory Population (EMP), were found January 5, 2017 in a field along Indiana 67 near the Goose Pond State Fish and Wildlife Area. State officials say preliminary evidence suggests the crane was shot during the New Year’s Day weekend. In February 2014 Direct Autumn Release (DAR) Whooping Crane No.35-09 was shot and killed in the same area as No. 4-11. At this time it is not known whether the two poachings are related. Female No. 4-11 successfully hatched her first chick, W3-16, on May 3, 2016 and proved herself to be a good parent when she continued to raise the colt alone after the unexpected death of her mate on their nesting grounds. She and W3-16 were seen during a July 15 aerial survey, but the colt was not seen on July 27 and later was presumed dead. After leaving Wisconsin, 4-11 migrated to her wintering area at the Goose Pond FWA in mid-December. Goose Pond is now considered a critical wintering area for this eastern population of reintroduced Whooping Cranes, and due to the high concentration of Whoopers found there, 4-11 would likely have re-paired in preparation for the upcoming breeding season. Anyone with any information about the poaching is asked to please contact the Indiana Conservation Officer Dispatch at 812-837-9536. In addition to the Endangered Species Act, Whooping Cranes are protected by state laws and the federal Migratory Bird Treaty Act. During the Fall/Winter 2013-2014 biologists replaced both non-functioning transmitters on female No.35-09. She was thought to be with a group of Whooping Cranes reported in Rutherford County, Tennessee on January 24, 2014 and in a group of seven reported in Franklin County, TN on January 29,2014. Then, during an aerial survey flight on February 12, 2014, her signal was picked up along the White River, south of Lyons in Greene County, Indiana. When no visual confirmation of No. 35-09 was possible, officials used the electronic signal emitted by a tag that had been previously placed around her neck to eventually locate where her remains had been hidden. Her carcass was collected from that location on February 19, 2014. The Indiana Department of Natural Resources TIP Advisory Board announced a reward of up to $5,000 for information leading to the arrest and conviction of the person or people responsible. Whooping Crane No. 27-08 was shot and killed in early January 2012 in Knox County, Indiana. In May 2012 charges were brought against Jason R. McCarter, 21 of Wheatland and John C. Burke, 23 of Monroe City, Illinois after officials received information in mid-January that a Whooping Crane had been spotlighted at night then shot and killed with a high-powered rifle. Suspects were identified during a joint investigation by multiple law enforcement agencies, wildlife biologists and private individuals. Jason McCarter filed a guilty plea agreement for violating the Migratory Bird Act by taking or killing a migratory bird, thus avoiding a criminal trial. The plea agreement included 3 years probation during which he could not hunt, possess or use a firearm or alcohol. In addition to 120 hours of community service to be served at the Indiana Department of Natural Resources Goose Pond Fish and Wildlife Area he had to pay a $5,000 fine to the International Crane Foundation. No. 6-05 with seven juvenile DAR Whooping Cranes in Louisville, Jefferson Co., KY in 2011. Whooping Crane male No. 6-05 (or #506) and seven 2009 Direct Autumn Release (DAR) juveniles spent several days in Jefferson Co., Kentucky before moving on to Adair Co., KY on February 12 or 13, 2011. They stayed there through February 28. In Fall 2011 No. 6-05 migrated with DAR female #37-09 to Jackson Co., IN where he was later killed. His carcass was found on December 30 by a local photographer monitoring the cranes near the Muscatatuck River basin about 40 miles north of Louisville, KY. X-rays showed a fatal gunshot wound caused the bird’s death. A reward was offered for any information leading to prosecution of the shooter of the federally endangered bird. On Saturday, November 28, 2009 Whooping Crane, female No. 17-02 (#217) and her mate, No. 11-02 were observed together at one of their previously used stopovers in Vermillion Co., Indiana by Eva Szyszkoski, International Crane Foundation (ICF) Tracking Field Manager. It is thought No.17-02 was killed soon after this sighting because on Tuesday, December 1 ICF tracking intern Jess Thompson found her carcass. A victim of senseless joy-killing by poachers. Her death was especially devastating to the Eastern Migratory Population of Whooping Cranes reintroduction program as she was the seven-year old mother of “Wild-1,” the first wild-hatched Whooping Crane to survive and fledge to migrate. She and her mate nested during each of the past 5 springs on Necedah National Wildlife Refuge. They hatched two chicks and fledged one (No. W1-06) in 2006, and they hatched one chick in 2009. The pair was known as the “first family” of the new Eastern flock, with No. 17-02 considered the “matriarch” of the program. Her death was a major loss for the reintroduction considering there were approximately 100 cranes in the eastern population at that time. Indiana Department of Natural Resources conservation officers and U.S. Fish and Wildlife Service special agents conducted a joint investigation into the incident with a citizen tip leading to the arrest of the poachers. 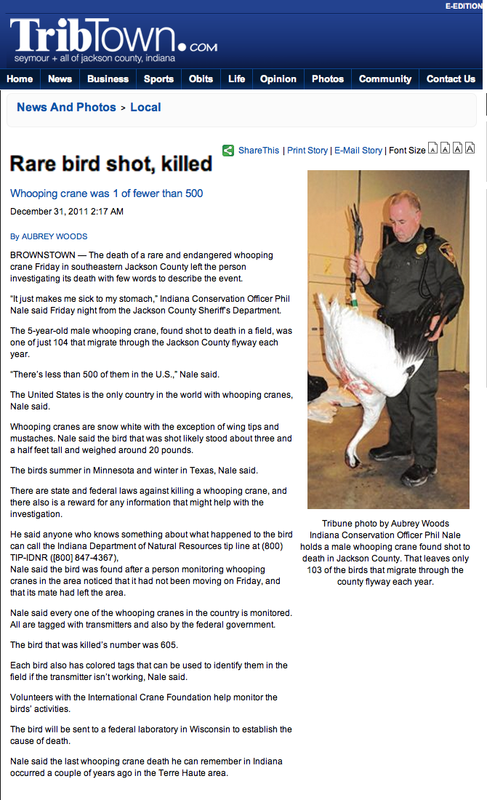 Wade Bennett of Cayuga, Indiana pled guilty and was sentenced on March 30, 2011, for his involvement in the shooting of Whooping Crane No. 17-02 in Vermillion County, Indiana. Unfortunately, Bennett and the juvenile received the bare minimum in sentencing – $1.00 fine, one year probation and minor additional fees. The sentence in no way reflected the enormous amount of time, energy and expense invested by the Whooping Crane Eastern Partnership (WCEP), International Crane Foundation, Operation Migration and other organizations needed to raise a single Whooping Crane to migration age.